Does this sound familiar? Your favorite band just came out with a new album. You buy every track, and can’t wait to start listening. As soon as you push play, you notice something is off. The track is catchy, but it sounds like half the band is missing. The sound is tinny, flat and it feels like your headphones are struggling to keep up. Or maybe you’re a musician in a recording studio. You’re trying to play along to what’s in your headphones, but everything sounds muffled and it makes adding that next track to your song tedious, difficult and really not that much fun. Plus, the headphones are just plain uncomfortable. If you’re a music lover, DJ or musician, you know the importance of a good pair of headphones. Music just doesn’t sound the same when you listen to it through a poorly-made audio device, and trying to produce great tracks is that much harder when the artist can’t get a feel for what they’re creating. That being said, the cost of really high-end audio gear can be a deterrent for some that are still craving this kind of listening experience. But rest assured, there are a number of newly-released personal audio devices that are finding a balance between affordability, sound-quality and comfort. In this review we’re going to be checking out the Noontec Hammo Wireless Headphones. These newly-released headphones are designed for both professionals as well as music enthusiasts, which made our expectations pretty high. We’ll be examining the design, sound-quality as well any special features contained in the unit to give you an idea of just how powerful these cans really are. Right out of the box, the Noontec Hammo Wireless Headphones are incredible stylish. They only come in black and, while some other headphones feel like they might look better in other colors, we felt that this was the right choice. The darker color made them sleek, understated yet still eye-catching enough to turn some heads. The golden accents also complimented the black exterior nicely, and made the layout seem even more unique. Each earpiece is large, comfortable and has the Noontech logo embedded into the outer section in an engraved golden square. There’s also a small golden rectangle located where the earpiece met the headband that read “Hammo Wireless.” It isn’t totally necessary, but was certainly a nice touch that added something special to the overall look. The ear-cushions are made of real leather, and cover the entire ear for an extremely luxurious fit. We found this to be really essential, since the headphones are on the bigger side, measuring at 7.28 x 7.09 x 2.56 inches. However, despite the dimensions being a bit large, they are incredible light for a device like this, weighing in at only 8.8 ounces. Other similar pairs of headphones weigh nearly a full pound which, over the course of a few hours, can be a little strenuous. The headband is also fitted with a plush leather pad. Between the soft cushions and the headband, it almost felt like we were wearing a giant pillow. 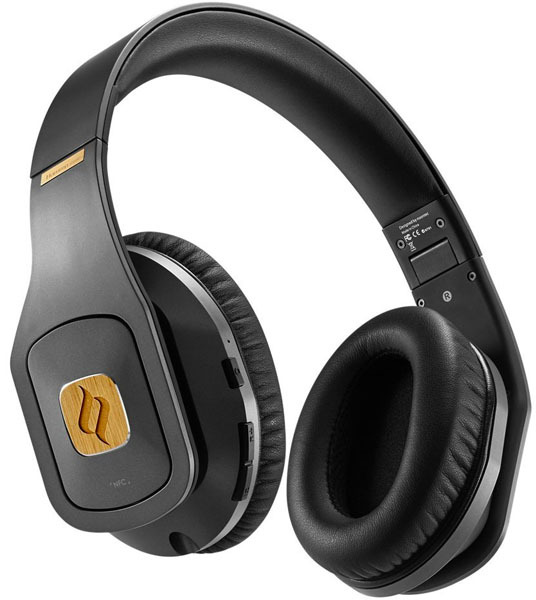 The added comfort provided by the ear-cushions and headband made us less concerned with the large size of the headphones because it increased wearability—a major bonus for a device we could see wearing for extended periods of time. They’re also adjustable, but do have some minor limits. The earpieces can be pulled away from the headband to your comfort level so head size isn’t an issue. 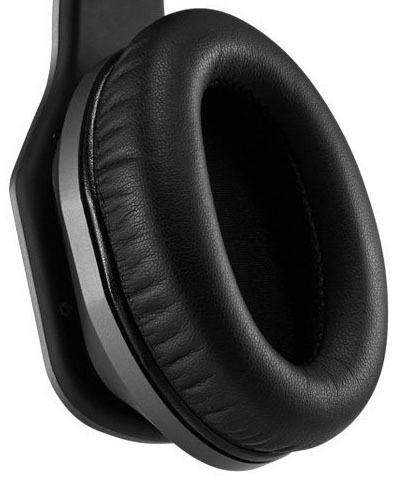 However, unlike some other wireless headphones, the earpieces do not rotate. There is some play in the earpieces that helps with adjusting the device, but it is still a far cry away from full adjustability. There weren’t a ton of controls on the headphones, but we actually found this to be a good thing. It made them easy to figure out, even before we looked at the included manual. Most of the controls can be found on the left earpiece. You’ll find a power button, volume buttons that also double as skip forward and skip back buttons, a built-in microphone as well as a port for a 3.5mm AUX cable. That’s really it, but for a pair of headphones that is designed to prioritize sound quality, we didn’t find ourselves wanting much more. 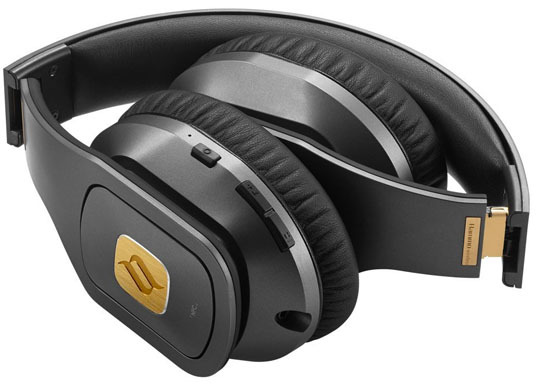 Also, there were still a ton of really cool features built-in that made these headphones stand out among a lot of other similar items on the market. The Noontec Hammo Wireless Headphones come fitted with some pretty impressive features. 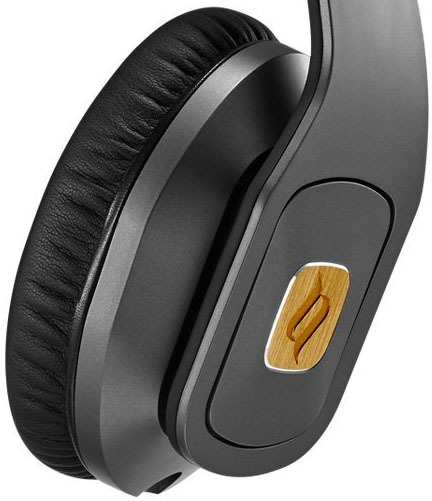 First and foremost, they are fully wireless and connect to all devices compatible with Bluetooth 4.1. They are incredible easy to pair too; all you have to do is turn them on, find them in your device’s Bluetooth settings and you’re all set. The signal held up extremely well, and even stayed strong when we got near the limit of 33 feet. There is also built-in NFC, which stands for Near Field Communication. NFC is slowly finding its way into more and more devices, and is equally as efficient to Bluetooth when it comes to connecting wirelessly. The battery life was another incredible feature. From a single charge, these headphones will yield a whopping 50 hours of play time. The built-in battery is equipped with low-power consumption, making the Noontec Hammo Headphones extremely energy efficient and reliable. Considering that they are designed for professionals who may need to rely on them for extended periods of time, this was a huge bonus. Still, on the off chance that the battery does run dry, you can still use the headphones as a wired device due to the 3.5mm port on the left earpiece. As far as reliability and efficiency, Noontec really has the bases covered. Lastly, we discovered that the headphones can be used as a hands-free device. There is a built-in microphone that enables you to take calls from your smartphone and, for Apple users, initiate voice commands to Siri. This wasn’t immediately obvious when we first opened the box, but it was certainly an excellent addition. As far as accessories go, you certainly won’t be disappointed. The Noontech Hammo Headphones come with everything you’ll need to get started. In the box you’ll get the headphones themselves, a charging cable, a 3.5mm AUX cable for wired listening, a USB to 3.5mm cable, an ¼ inch adapter, as well as a sturdy, carbon-fiber design carrying case. The accessories really are a testament to how much you can do with these headphones, and the carrying case, while not real carbon fiber, was still strong enough to protect the headphones from getting damaged while you aren’t using them. The sound that these headphones can produce is absolutely outstanding, and is about what we expected for the price. They are a little bit more expensive than some other wireless headphones, but once you listen with them for the first time you’ll know why. First and foremost, Noontech has gone above and beyond when it comes to the kind of technology that went into this device. Utilizing an SCCB design, the Hammo Wireless produces the kind of high-fidelity sound that a professional producer expects. SCCB stands for Surround Closed Cavity Body and is a custom design in each earpiece that maximizes sound quality. Noontech claims to have developed this design specifically for the Hammo Wireless, making them not only cutting-edge, but a truly one of a kind personal listening device. Each earpiece is also fitted with a Votrik HD 500 50mm speaker that delivered a deep, powerful bass response as well as sharp and punchy trebles that made us feel like we were in a recording studio. We found that no matter what we listened to, the sound was crystal clear, full and immersive. 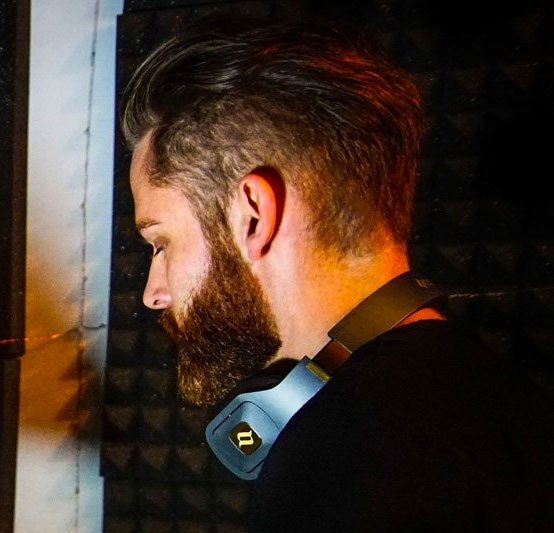 These headphones will undoubtedly do the job for a music producer or DJ, and will be equally as stunning for the average music enthusiast who takes their listening seriously. It goes without saying that the Noontech Hammo Wireless Headphones are a seriously stylish and high performing listening device. 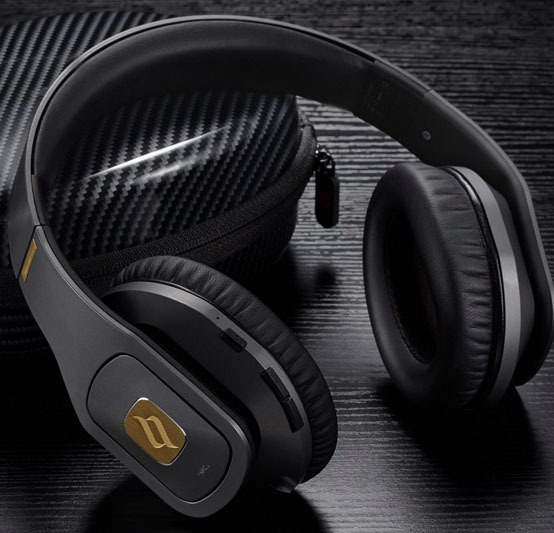 The black and gold design was luxurious, comfortable and eye-catching and the headphones were incredibly lightweight given their outstanding sound quality. They were easy to use, had a very energy efficient battery life, were versatile in their applications and will undoubtedly be able to please even the pickiest of users. While they do have a slightly higher price point than some other similar items on the market, we found it to be completely justified by the outstanding performance as well as the included accessories. 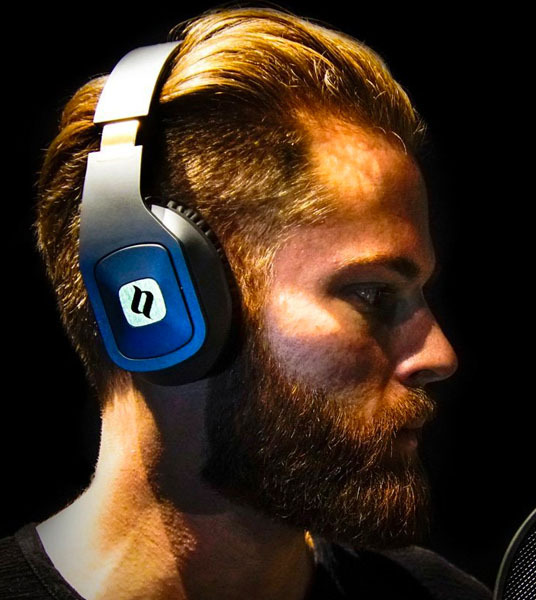 Primarily, these headphones seem like they would be best suited for home or studio use, but the included 3.5mm wire as well as the tough and durable carrying case made us feel like they would be equally as useful on a long trip.